curator). Frieze London 2017 once more coincides with Frieze Masters and Frieze Sculpture in The Regent’s Park, together forming the heart of Frieze Week, the most significant week in London’s cultural calendar. Frieze London is supported by global lead partner Deutsche Bank for the 14th consecutive year, continuing a shared commitment to discovery and artistic excellence. 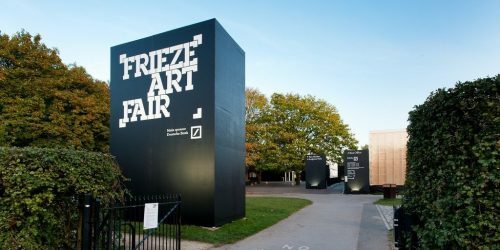 Continuing Frieze’s enduring relationship with collecting institutions, Frieze London again partners with two acquisition funds for UK public collections, including the Frieze Tate Fund, supported by WME | IMG; and the second edition of the Contemporary Art Society’s Collections Fund at Frieze, this year supporting the Towner Art Gallery (Eastbourne). Allied Editions also returns to the fair, raising vital funds for seven non-profit galleries across London and guest regional partner, Focal Point Gallery (Southend-on-Sea). Victoria Siddall, Director, Frieze Fairs said: ‘The list of exhibitors for Frieze London is stronger than ever – from the emerging to the world’s most established – signifying that Frieze Week in this city continues to be a vital hub for international galleries. Following the fantastic reception received by The Nineties last year, I’m looking forward to another innovative, thoughtprovoking curated section, this time celebrating radical women artists as well as the ground-breaking role of their galleries. And for the first time, Frieze Sculpture will open in July, creating a free public exhibition of extraordinary outdoor works that will take us through to Frieze Week in October.